Torch Lake is one of the most extraordinary lakes in Michigan. Its surface area is second largest in Michigan, but its great depth (about 300 feet, depending on the map) gives it by far the greatest depth and water volume of any inland lake in the state. As a result, Torch Lake has the longest flushing rate of any lake in the Elk River Chain of Lakes. Often, it does not freeze because of the large amount of heat stored in its vast volume. It is also Michigan’s longest inland lake. With a steady 35 mile per hour north or south wind, waves up to 4.5 feet high can develop. Formerly a deep, fjord-like bay of ancient Lake Michigan, Torch Lake became an inland lake when a sand bar formed across the mouth of the bay (now the lake’s northwest end). The shoreline consists mostly of cobble-sized rocks. However, large areas of sand are present in some locations, most notably at the north and south ends. Bottom sediments in the deepest waters are grey or white in color due to the deposition of marl with only low levels of organic material. Almost everywhere, the lake has a wide, sandy, shallow region paralleling the shore, which ends in a steep drop-off. Aquatic plants are sparse, with muskgrass (or Chara) being the most abundant. Pondweeds, water milfoil, and wild celery (or tapegrass) are found in only a few locations. Named tributaries include the Clam River (Torch Lake’s major inlet), and Spencer, Wilkinson, and Eastport Creeks. All of the other tributaries are very small and apparently unnamed. The Torch River flows out of the south end of the lake. 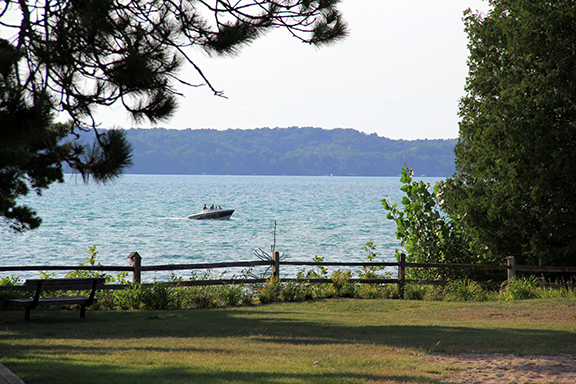 Torch Lake is noted for its coldwater fishery, including lake trout and whitefish, both of which are self-sustaining through natural reproduction. Burbot are common in a deep-water community association with the trout, whitefish, and deep-water sculpin. Smallmouth bass, yellow perch, and rock bass, and muskellunge are commonly fished for in Torch Lake, and Torch Lake is known for large muskies and whitefish. Fishing pressure is generally considered to be light. Because of its unproductive nature, Torch Lake does not yield large numbers of fish. Fish Consumption Advisories have been listed for five species of its fish: brown trout, lake trout, lake whitefish, smallmouth bass, and yellow perch. High concentrations of mercury, PolyChlorinated Biphenyls (PCB’s), and dioxins—all toxic byproducts of industrialization—are the reasons for the advisories. It has recently been advised to never eat lake trout from Torch Lake, even for a healthy male. More information is available in the link under Additional Resources below. Torch Lake is monitored every three years through the Watershed Council’s Comprehensive Water Quality Monitoring (CWQM) Program for dissolved oxygen, specific conductivity, pH, nitrate-nitrogen, total nitrogen, total phosphorus, and chloride levels. Water transparency, chlorophyll-a, and water temperature are also monitored in Torch Lake each summer by volunteers as part of the Watershed Council’s Volunteer Lake Monitoring (VLM) Program. This lake is monitored through the State’s Cooperative Lakes Monitoring Program (CLMP). This project is a collaboration between the Watershed Center, Three Lakes Association, Friends of Clam Lake, Antrim Conservation District, Elk-Skegemog Lakes Association, Intermediate Lake Association and Tip of the Mitt Watershed Council. 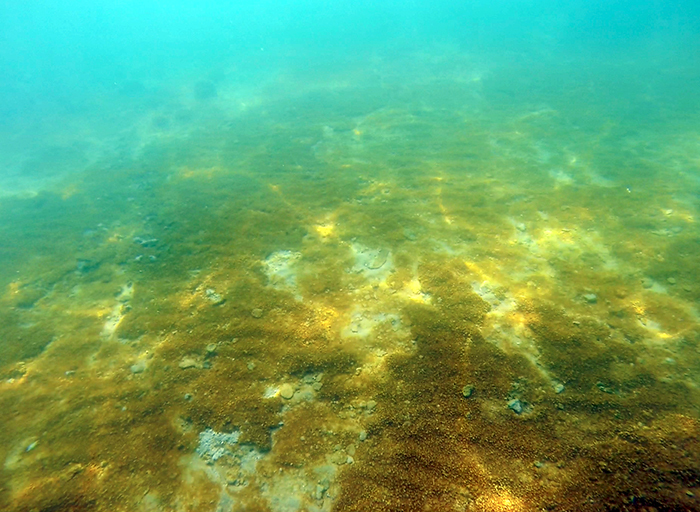 Golden-brown	benthic	algae	is	not	new	to	Torch	Lake, but its	prevalence	in	recent	years seems	to	be	increasing. More	riparians	are	asking	questions about this aesthetic	nuisance in the near-shore	bottomlands. Due to the volume of questions about this algae, Three Lakes Association has created a web page dedicated to providing the public with more information on this topic. Below are a few links of interest. Golden-brown benthic algae on the bottom of Elk Lake. Photo: Tip of the Mitt Watershed Council, Dan Myers. Torch Lake Protection Alliance (TLPA) was established in 1994 to provide a unifying voice for people who regard the preservation of Torch Lake as a top priority, enabling current and future generations to enjoy the responsible use of the geological jewel. Torch Conservation Center, Inc. is a local nonprofit organization promoting stewardship in the Torch Lake Watershed through freshwater education and land conservation to ensure a sustainable future for Torch Lake. View an interactive map, including public access sites, at Michigan Fishweb. 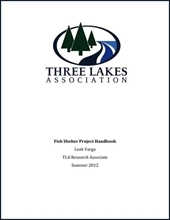 Learn about safely eating fish from this lake in the Michigan Fish Consumption Advisory.